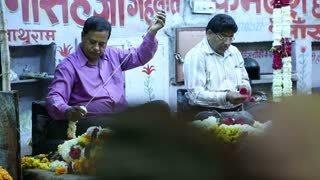 JODHPUR, INDIA - 17 FEBRUARY 2015: Indian men piling up colorful flowers to a large string. 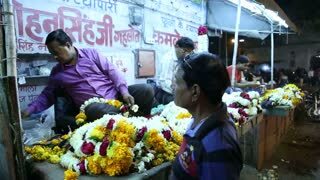 JODHPUR, INDIA - 17 FEBRUARY 2015: Indian man selling flower necklaces at a street stand in Jodhpur. 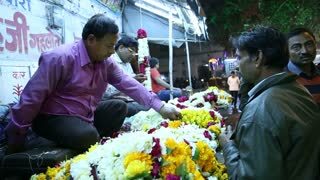 JODHPUR, INDIA - 17 FEBRUARY 2015: Indian men piling up colorful flowers to a string at street stand in Jodhpur.